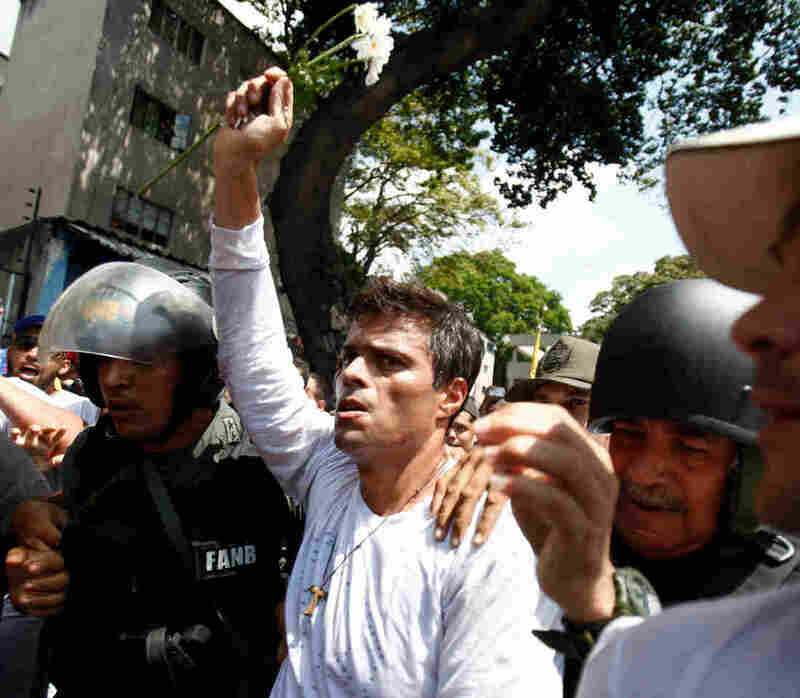 Venezuelan Opposition Figure Leopoldo López Sentenced To 13 Years In Prison : The Two-Way López found him guilty of inciting violence during last year's protests in Venezuela. Amnesty International has called the charges against López "politically motivated." Opposition leader Leopoldo López is flanked by Bolivarian National Guards after surrendering in 2014. A judge in Venezuela has sentenced one of the country's most prominent opposition figures to 13 years in prison. The judge found Leopoldo López guilty of inciting violence during protests that began on Feb. 12, 2014, and left dozens dead and hundreds injured. Last November, Amnesty International issued a report that called the charges against López "politically motivated." "Mr. Lopez will serve his sentence in the Ramo Verde military prison outside Caracas where the 44-year-old Harvard University graduate has been held since he turned himself into authorities in February 2014. The case of Mr. Lopez, a telegenic former mayor of the wealthy Caracas municipality of Chacao, has become a cause célèbre for detractors of President Nicolás Maduro who accuse the leftist leader of trying to silence political rivals. "'Leopoldo has become the first person in Venezuelan history to be sentenced to prison just for his words,' said Lester Toledo, an opposition lawmaker and member of Mr. Lopez's Popular Will political party." Venezuela's El Universal reports that López will appeal his sentence. The paper reports that his wife Lilian Tintori called on Venezuelans to gather for a protest at José Martí Plaza today. "The country demands justice," she said, according to El Universal. "Everyone recognizes that he is innocent and he is quite simply a political prisoner."